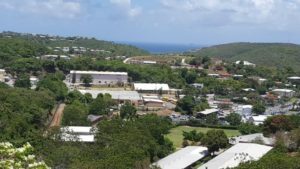 At a public meeting held on Aug. 23 in Anna’s Retreat, the U.S. Environmental Protection Agency (EPA) provided information about a proposal to improve cleanup efforts at the Tutu Wellfield Superfund Site on St. Thomas and took comments from the public. The EPA has proposed a plan that would modify current cleanup activities at the Tutu Wellfield Superfund Site. Previous industrial and commercial activities at the site contaminated the soil and groundwater with chlorinated volatile organic compounds. The EPA’s proposed action expands and enhances the groundwater cleanup system that is currently operating at the site. In response to past releases of hazardous substances from businesses in the area, the EPA required each responsible party to address soil contamination on their respective properties and the groundwater contamination that emanated from their operations. The EPA’s proposed cleanup plan would add additional wells to pull out groundwater from more of the areas that are the source of contamination and make the system more effective. The cleanup proposal also includes re-injection of treated, clean groundwater to create an underground barrier down gradient of the source area and long-term monitoring and restrictions on the use of groundwater in the vicinity of the site. To learn more about the cleanup or to review EPA’s proposed plan, visit: www.epa.gov/superfund/tutu-wellfield.